Judith Donath has been doing social media, interaction design, and data visualization long before social media existed, as the principal investigator at the MIT Media Lab’s Sociable Media Group. 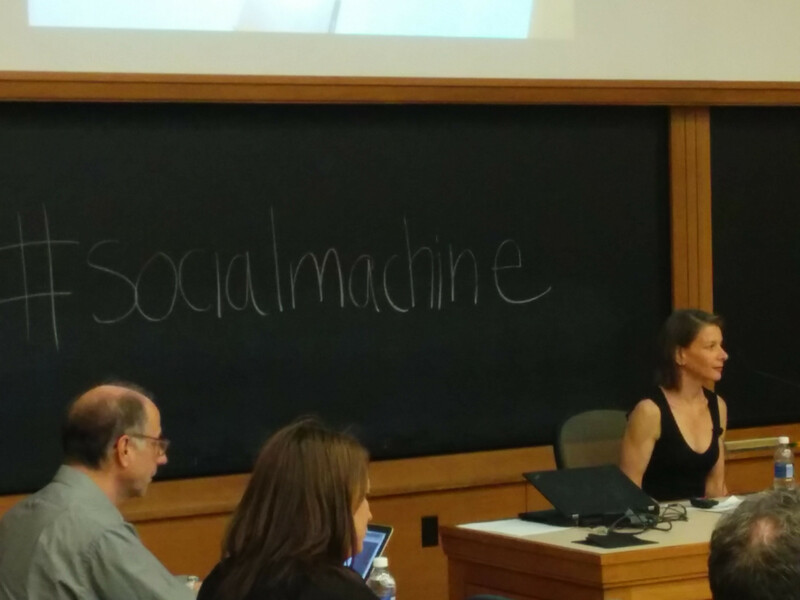 Today, she launched her new book, The Social Machine. Erhardt and I were there to blog it. As more people socialize, marry, and go to school online, our interfaces remain unsophisticated compared to the social interactions we tend to have elsewhere. We tend to think that our recent creations offer the culmination of human evolution, but there’s so much that we don’t see. Many of the problems we see online– such as poor behaviour and difficulties with telling the veracity of information– arise from the difficulty of fully using our senses when interacting with others. There’s still something intriguing about being around other people and feeling the energy within a room that is not as easy to perceive through a screen, Judith tells us. While screens connect us to tremendous crowds we don’t see the same level of patterns and complexity there. Judith tells the story of the “who” command in an MIT computer system the early 1990s, where it was possible to see a list of usernames that are online, watching them log in and log off. She wished she could see the ebb and flow of people online like looking through a window. Judith created “Visual Who,” a system that showed who was online at various times in the day. Since the visualization organized them by their interests, it was possible to see patterns in people’s behaviour. Inproving Legibility of Social Interactions with Data Visualizations She notes that 20+ years later, on networks like Twitter and Facebook, the visualizations used to show people interacting online are not much different—the patterns of interaction are still very hard to see, they still just vertical lists of names and text snippets. 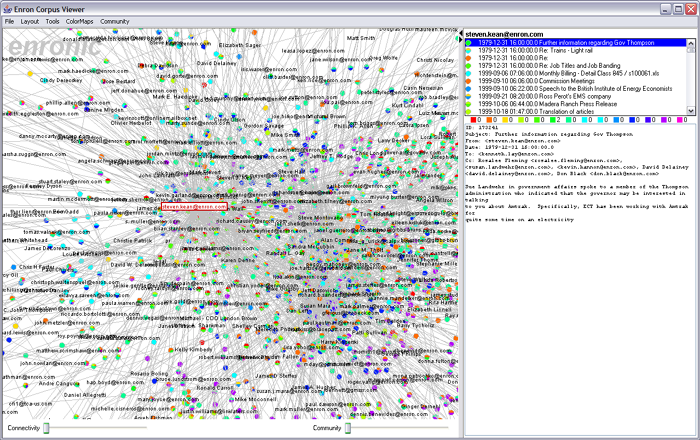 Many people have enjoyed creating network graphs of their social relationships. Judith mentions the Talk pages on Wikipedia as one place for the underlying interactions of a social space are disclosed. Her former student Fernanda Viegas worked Martin Wattenberg on visualizing those edits on a Talk page to make them more legible. Going Beyond Being There Although some people complain that the Internet isn’t the same as face-to-face interactions, Judith argues that we should go beyond just recreating the experience of being there, “explore extraordinary possibilities.” She talks about a paper by Hollan and Stornetta that has been a powerful influence in her approach, Beyond being there. Once we move beyond simply trying to recreate reality, there’s an enormous amount of possibility. Chat Circles and Talking in Circles by Roy Rodenstein are two examples of technologies that go beyond being there. By arranging chat participants in circles on a two-dimensional screen, it’s possible for participants to move around a space and hear only the people who are close to them. This interface allows opportunities like overhearing, introductions, and the chance to move to areas that aren’t being recorded. Interfaces shape our social interactions, says Judith. One great example of this is Conversation Clock, a project by another former student of Judith– Karrie Karahalios– with Tony Bergstrom. Conversation Clock shows who’s been speaking when, who’s speaking the most, and who is speaking over other people. It’s based on Visiphone, which was created by Judith’s research group at MIT. How can we manage our privacy in a context where our social signals are always being archived? Judith points us to the example of portraiture, an art where portrait subjects have often had a large amount of control over how they are depicted. She argues that it’s important to think of data visualizaton as portraiture. Maybe people have their own opinions about how they might want to be represented (subjectively) in a data portrait. Social Portraits How can we make something expressive if it doesn’t have a face? Judith talks about The Rhythm of Salience, a visualization she was commissioned to create about an existing conversation. What made this a portrait? Judith took words that differentiated individuals from each other and presented what made them unique. Produced for Themail,” which creates a portrait of a single relationship as expressed in email. In this visualization, column heights represent the volume of email, while the displayed words are those which were unique to that month– like a postcard or photograph of online friendships. 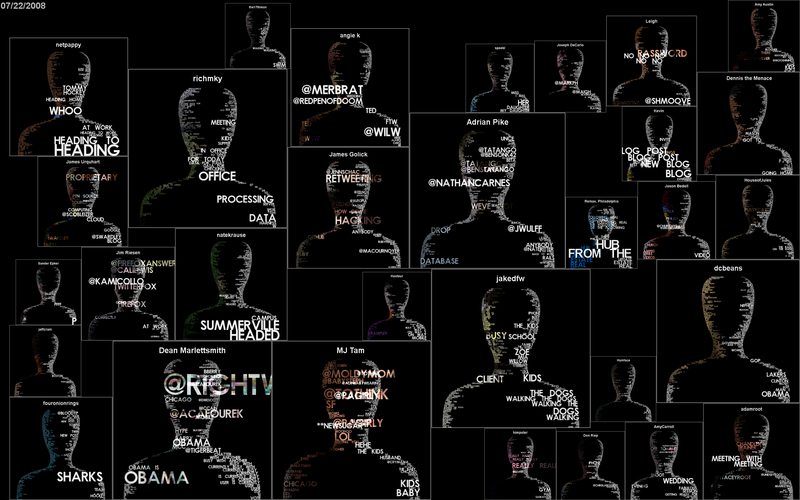 The Personas project, created by Judith’s student Aaron Zinman, is another example of a personal data portrait. The system searches Google for mentions of your name and then shows a visualization of search results, including all those who share your name in Google’s results. Response by David Weinberger David says he wants to start by channeling Sherry Turkle. Judith has claimed that the reason we’re looking at our phones is that they seem to be working for us. David wonders if the the real reason may be that there’s something pathological going on. In Judith’s book, she presents the idea that our social world is being mediated by information that’s disconnected from us, and whose power comes through its incredible fluidity. Is this new type of social self a diminished self, and does it have an influence on our “real” self? Judith, in response, connects to Jane Jacob’s book The Death and Life of Grant American Cities. She wrote the book to outline principles that would make cities better. Judith sees the point of the book as an argument for what are the things we want to make better. What ways do we want to have control over data, sees things more vividly, etc. There is still a big difference between how we deal with each other in person versus on the screen. However, that difference has diminished in the past few years. She says that as wearable computing and heads up displays with really collapse these differences with dramatic changes for how we interact with others. We can no longer distinguish how we interact or mean to interact in one space of the other. Judith: Something I think is really important about the portraits is connected to the reduced use of pseudonymity online today. The use of real names online is different than it is online because your actions persist online. If you have a pseudonym with a history and reputation gives you enough to have credibility in a space without having that connected to who you really are. Nicholas Negroponte: Why are things taking so long to do social media well? Judith: The web set back social media tremendously. It made it very easy for anyone to be a writer and contributor. But it made it very hard to do anything with multimedia or to have a kind of identity to its design, especially in the early years. Design has also become very conservative among groups trying to make a big hit by chasing the last big hit, i.e. becoming the next Facebook. Q: Have you tried to do anything with design around generational differences? Judith: I haven’t specifically done work on this. But this is an issue around legibility because vocabularies change. You have to build off of what people understand. There is also a tension between what’s open and what’s not: in-groups and out-groups are defined by what is legible to one group or another through vocabularies. Q: Will email or instant messaging win the messaging war? Judith: Styles change in technology. Young people who are on the phone a lot and want something that’s ephemeral are tending to use those tools. Ultimately, Judith thinks that this distinction is like the difference between two restaurants. The social meaning that email is for parents is less related to its utility than to the current fashion. Pattie Maes: You argued that we need to design online spaces with different characteristics around privacy or ephemerality, but how can designers guarantee these issues? Users seem always capable of undoing the designer’s intentions, for example by taking a screenshot of a Snapchat. Judith: Design can’t guarantee this. But you can have good enough privacy. I think the reason these visualizations are important is that they show you the history is being recorded, displaying the reality of publicness where that is not the case. Q: Did you study Second Life at all? Judith: It seems like every seven years, there’s a new 3D technology that comes out that offers a fashionable 3d space for people to hang out in. These projects try to reproduce the feeling of being in a place without going beyond face-to-face. Why are there chairs and virtual coffee in Second Life when people don’t need chairs or coffee? Spaces like Second Life don’t offer a chance to restructure conversations beyond physical limitations, they just reproduce physical limitations. Q: A lot of this is skeuomorphism, and you talked about the importance of metaphor and that is holding us back. Is it an art coming up with the ideas that break old metaphors? Judith: I talk about this in the first part of the book on metaphor. George Lakoff and Mark Johnson’s Metaphors We Live By suggests that we have no ability to think in pure abstraction. If your metaphors are too heavy-handed they can limit what you do. Most email systems are built on email in files, folders, and other folders. People spend time filing email and it drives them crazy. Technically, they don’t need those files and folders. The art of design is to do something more abstract while still do something that is legible to people. Q: What are the implications for your work and for designers in the balkanization of the internet? Judith: Yes? Almost any interface has implications for connections between people. Language is one obvious one. Are there ways that design and imagery can bridge divides of language? You also need to be cognizant of your own cognitive filters. Talking about subjects, norms, and caricatures, your caricature will look very different if your norm is different. Q: What do you think about the idea of visualizing negotiation strategies? Judith: Karrie Karahalios’s work goes in this direction. Q: Roughly how long does it take for us to peg our interfaces to actual physical things? Judith: It’s very much about style. Apple does things very beautifully, but they may be losing your shine. Being able to look at big trends like that is hard.